Diwali, the festival of lights, is just around the corner. A celebration of goodness, knowledge and hope, every Indian household looks forward to this festival irrespective of caste, creed or religion. A profusion of traditional sweets and snacks are prepared in every home. In fact, delicious, ghee-laden sweets have become so much of a highlight of Diwali, that many even refer to it as the ‘festival of sweets’. The Indian sweetmeats also known as mithai are not just desserts. These delicious, sweet morsels nibbled through the entire festival period are often considered a combination of snack, confectionary and dessert. 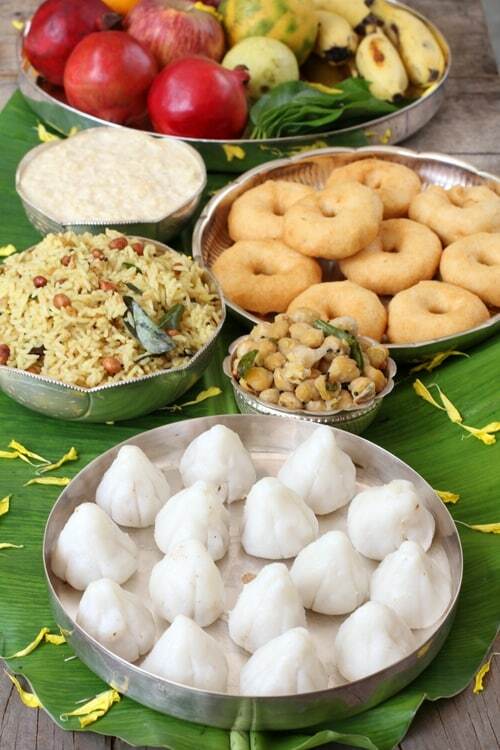 Back home in India, this is the time when you get together with the other female members of the household preparing the sweets and snacks in advance. It is customary to exchange sweets with family and friends during this colourful festive season and some of the traditional Diwali sweets include laddoo, barfi, halwa, sohan papdi, mawa kachori, moti pak, packed in beautifully decorated boxes. My pick for this festive season is the barfi, a simple mithai made from milk, ghee and sugar. There are plenty of variations but some of the famous ones include the besan barfi (made with gram flour), kaju barfi (a lush addition of cashewnuts), pista barfi (with the green goodness of pistachios), coconut barfi (with the sweetness of freshly grated coconut). 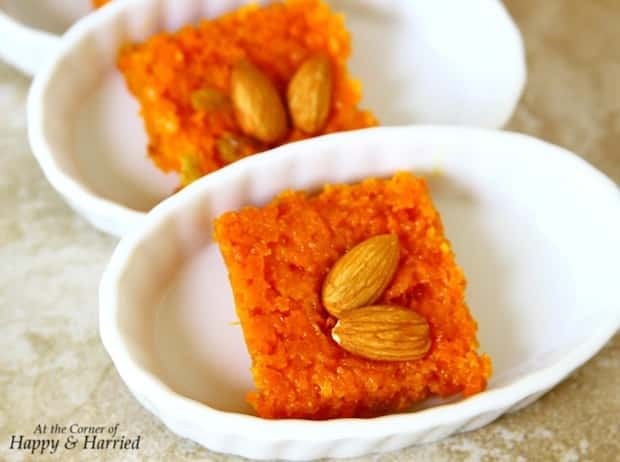 This Diwali, let’s add a healthy twist to our humble barfi with this delicious carrot or gajar barfi. Carrots have an extremely high nutrition profile; packed with vitamin A and antioxidants, it is indeed the common man’s powerfood. 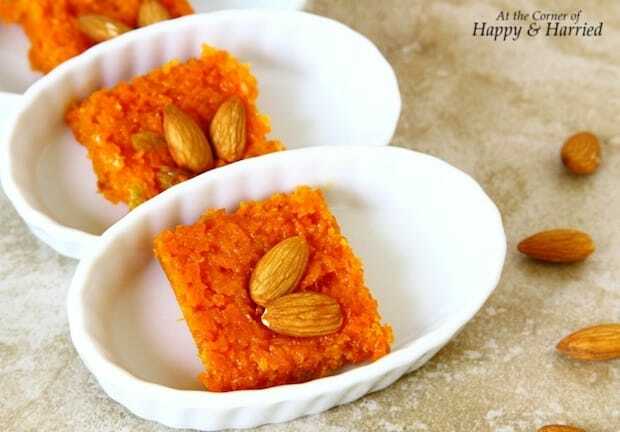 The carrots not only lend nutritional goodness to this barfi, but the beautiful orange colour imparted makes it perfect for this colourful festive season. Being such a simple recipe, preparing sweets this Diwali does not have to be a chore. These can be made ahead of time and also in bulk to be distributed among family and friends. And a plus factor – kids love it! 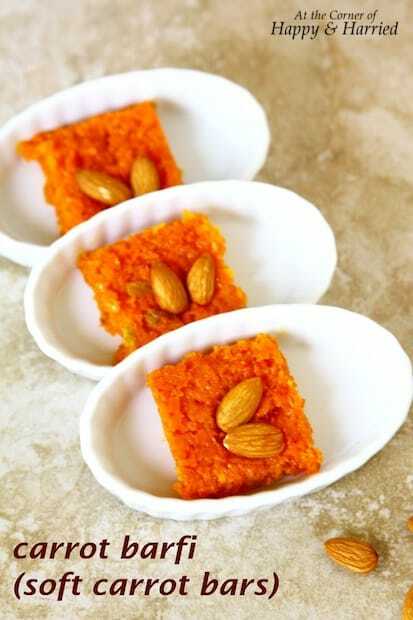 Eaten on its own, or served with a dollop of ice-cream, this gorgeously delicious, healthy carrot barfi will definitely be the ‘wow’ factor at your dinner parties. So, here’s how you make these soft, melt in the mouth, carrot cakes with a hint of cardamom, sweet raisins and crunchy almonds. Heat ghee in a large pan. Add the grated/chopped carrots and sauté on medium heat for 4-5 minutes. Now add milk, cardamom powder and ¼ cup sugar and cook the carrots further. When most of the liquid evaporates, taste and add more sugar, golden raisins and a pinch of salt. I ended up using slightly less than ½ cup of sugar as I like the barfi to have the natural sweetness of carrots. The sugar will introduce some more liquid. Stir constantly and cook it further till fairly dry. The barfi is done when the mixture leaves the sides of the pan and starts to come together. It will also have a lovely sheen to it. Remove from heat and spread the barfi onto a greased plate/flat dish and flatten to 1/2 inch thickness. 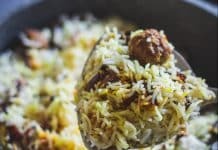 Top with toasted almonds or cashew nuts. Cool slightly in pan and refrigerate till set. Cut into squares using a greased knife and serve. The barfi will be set, but with a soft, melt-in-the-mouth consistency. Refrigerate any leftovers in a closed container. The carrots are cooked in milk to make the barfi creamier. 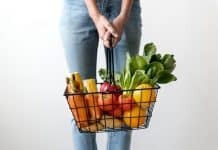 If you are vegan, use vegan butter instead of ghee, and water or milk substitutes instead of regular milk. For an even easier recipe, use sweetened condensed milk instead of milk and sugar. Use beetroot instead of carrots to make beetroot barfi. 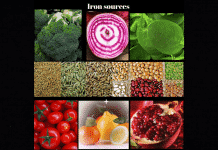 Beets may need more milk as it takes longer to cook.